Most of the time, I know what I’m going to write about on the blog. But once in a while, something magically falls in my lap. That’s what took place last week. So often I focus on the stones but I’m hitting for the fences this time. After reading Part I of my series on the Presbyterian Church on Edisto (PCE), I was contacted by Dr. Anne Chandler Howell. A sociologist and author, Dr. Howell has taught at the Philadelphia College of Textiles and Science, Suffalk University, Wellesley College and Cheyney University. 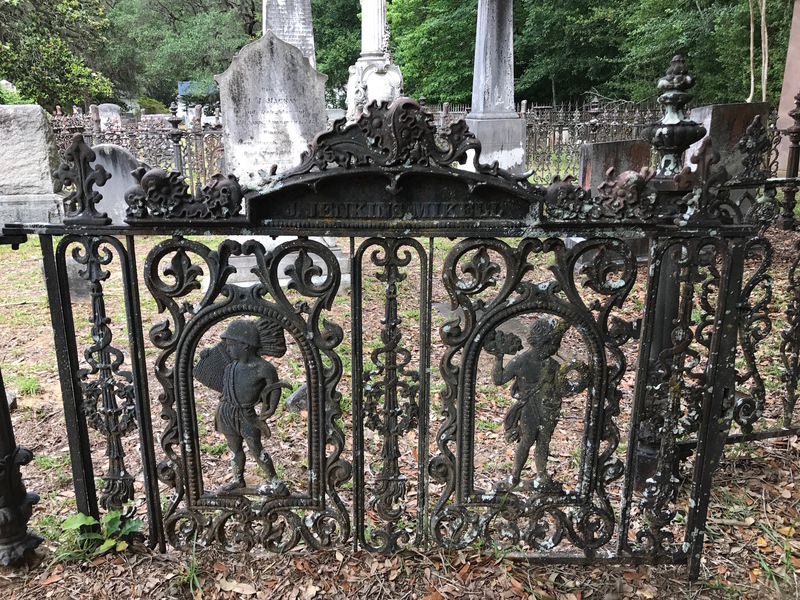 Currently, Dr. Howell is doing research on shipments made by the Robert Wood Ornamental Ironworks of Philadelphia, Pa. She saw my pictures of the PCE graveyard and noticed that one of the fences looked familiar. After she looked at the additional photos I sent her, Dr. Howell confirmed that some of the fencing had indeed come from that company! 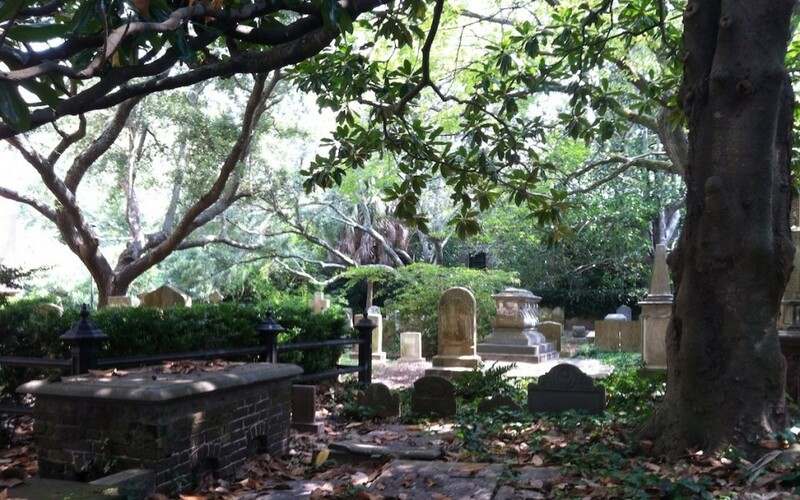 This first one surrounds a number of plots, which includes the Legare, Seabrook and Edings family members. It’s what I think looks like a “knotty wood” pattern with intertwined leaves and vines, while the posts resemble nubby trees and branches. Here’s a large view of the cast iron fencing with a woody-type design. You can see the detail of the design a little more in this photo. 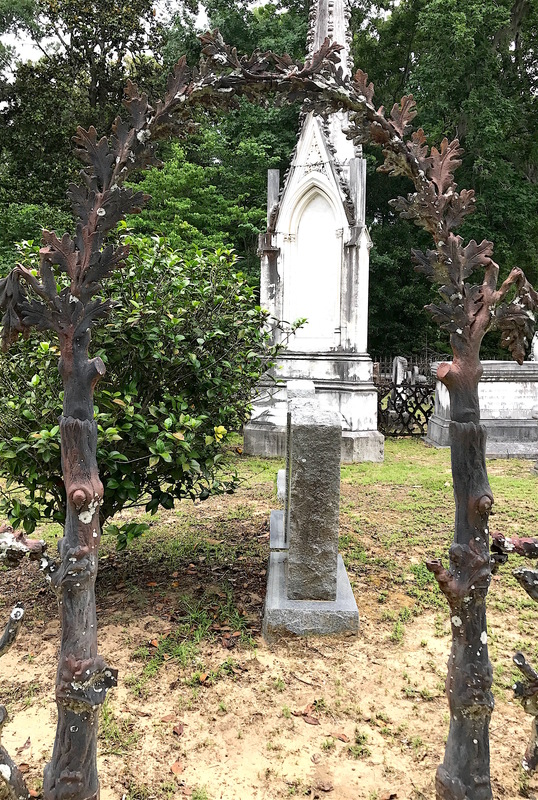 Three members of the Legare family are buried in front of the fence. Fortunately, there’s a copy of one of the company’s catalogs online (by that time it was called Wood & Perot) and I was able to pinpoint which one I think it is. You can see what it looked like below. This is from a catalog customers might have perused before making their choice. 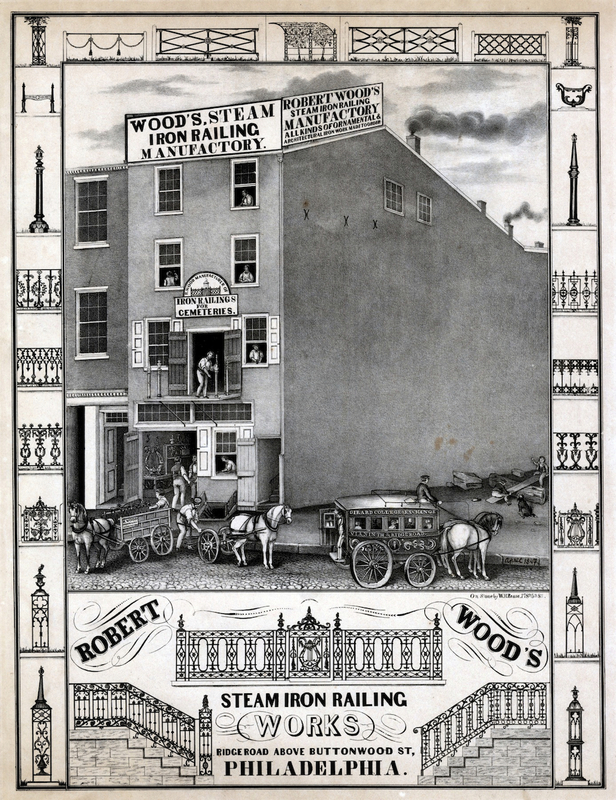 It turns out that Robert Wood opened his forge in Philadelphia in 1839. He operated under the name “Robert Wood” until 1849, when the business expanded. 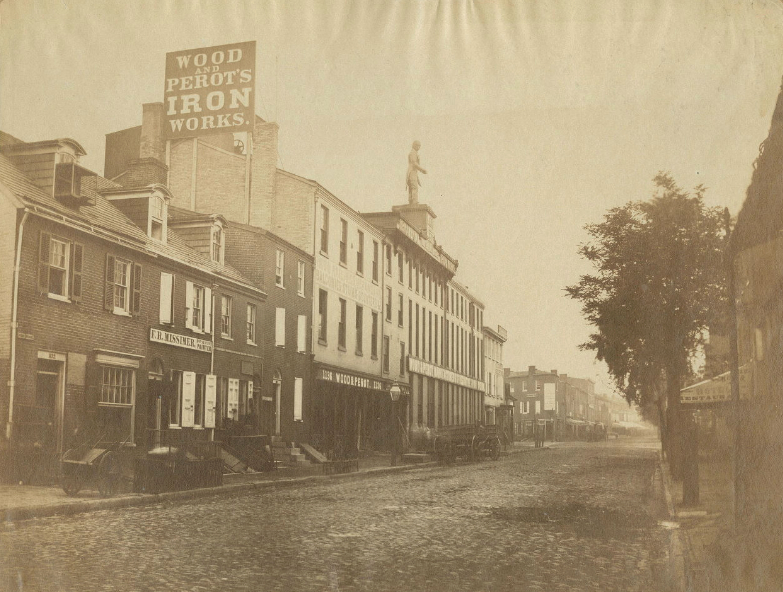 He changed it to “Robert Wood, Iron Rail Foundry and Manufacturing.” By 1853, Wood’s business had grown into nearly an acre of workspace with 200 employees. 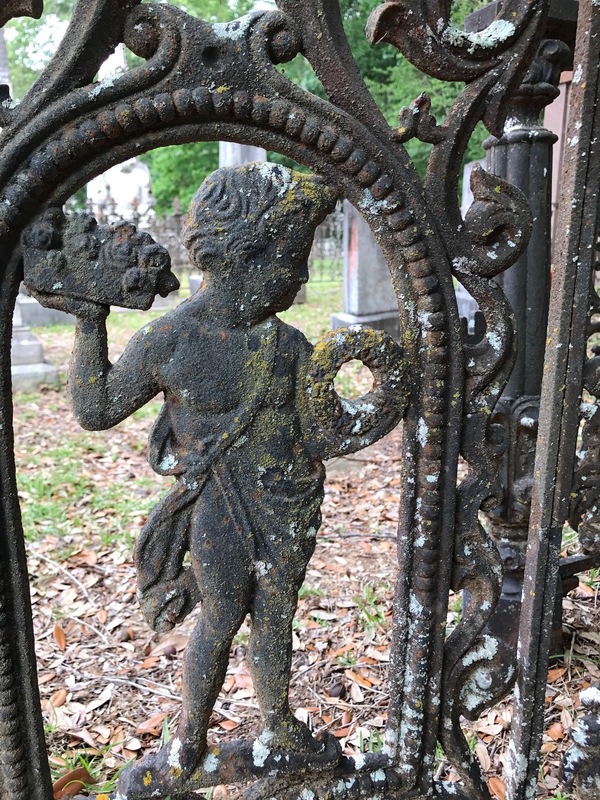 Ornamental cast iron was very popular from the late 18th century through the late 19th century. I learned that cast iron differs from wrought iron because it allows for greater plasticity and more elaborate designs, including raised relief which cannot be accomplished with wrought iron. Wood’s business grew bigger when he partnered with Elliston Perot, becoming Wood & Perot, from 1857 to 1865. In its last incarnation, the foundry became Wood & Perot Ornamental Iron Works from 1865 until the company went bankrupt and the foundry closed in 1878. Wood started his career simply making window guards and awning posts, working his way up to large bronze statues. The biggest was a 15-foot sculpture of Henry Clay for the town of Pottsville, Pa. Perhaps his most prestigious creation was President James Monroe’s tomb at Hollywood Cemetery in Richmond, Va., created in 1859. 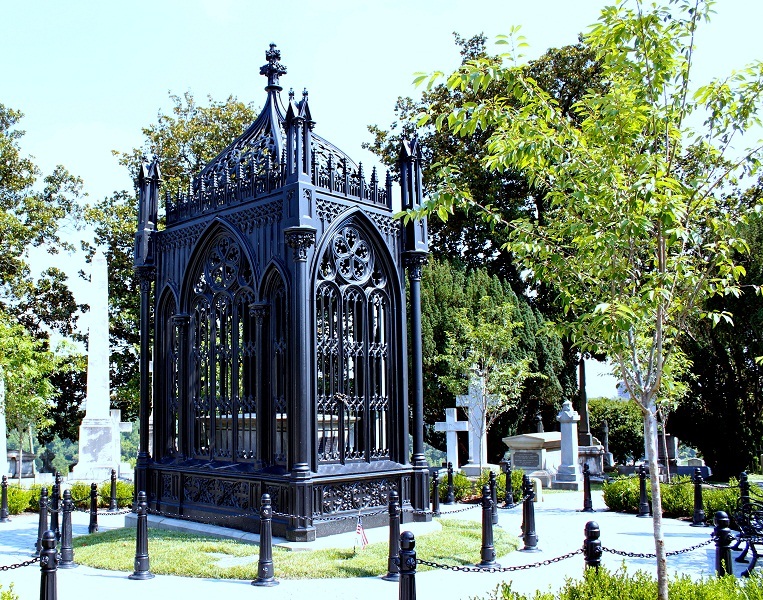 In 2015, Monroe’s tomb received a $900,000 makeover from the Department of General Services in the state of Virginia. According to an article by Karen Chernick, projects started in the pattern room, where a wooden model was created to size. This alone could take several weeks. Final designs were taken to the foundry where a mold was made from the pattern. Because it took so much work to produce these patterns, they were kept in a storeroom for future projects. In 1853, Wood’s pattern room was filled with between 3,000-4,000 patterns, 150 of which were fence patterns. While the molder worked, the charger prepared a cylindrical 12-foot tall by 38-inch wide cupola (or melting pot). The inside of the cupola had to be continually stacked with sand, wood, coal, imperfect castings from the previous day, and then more coal and iron. Once the contents of the cupola were lit, it took about two hours for the iron to melt. Workers then spent the afternoon bringing ladles to an opening at the bottom of the cupola and filling molds situated all over the room with the liquid iron. Dr. Howell told me customers often chose what designs they liked in the showroom and then customized them to meet their needs. I saw that whomever bought the woody patterned fence had also chosen a Woods & Perot arch. In the photo below, you can see what it looked like in the catalog, but with a different fence design. This is what the arch looked like in the Woods and Perot catalog. Here’s how the actual arch looks in the PCE graveyard now. You can see how the leaves on the ends bend down, just like the ones in the catalog. Since the Seabrook family (the most likely candidates for purchasing the railing) lived on Edisto, they were quite a distance from Wood’s Philadelphia showroom. They may have simply flipped through the catalog, chose what they wanted and ordered it sent to them. 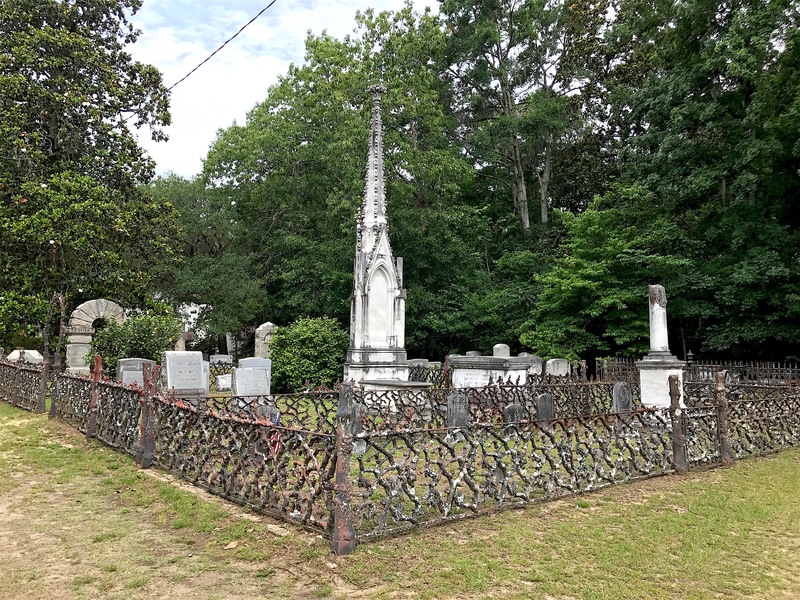 Dr. Howell was also interested in the fencing around the Mikell family plot so I sent her more photos. She confirmed it can also be found in the Wood & Perot catalog. She was especially interested in the gates. Here you can see the fence design that the Mikells (who intermarried with the Edings and the Seabrook families) chose. 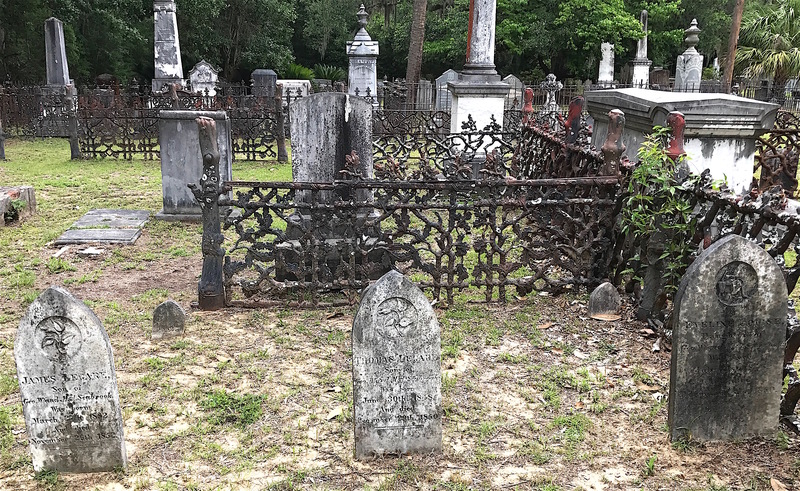 This Mikell plot’s fence style includes an arrow motif. Dr. Howell told me that this style of railing was indeed No. 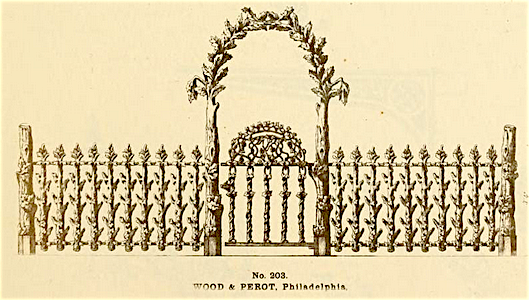 42 out of the Wood & Perot catalog, although the Mikells chose a different gate than the one in this illustration. 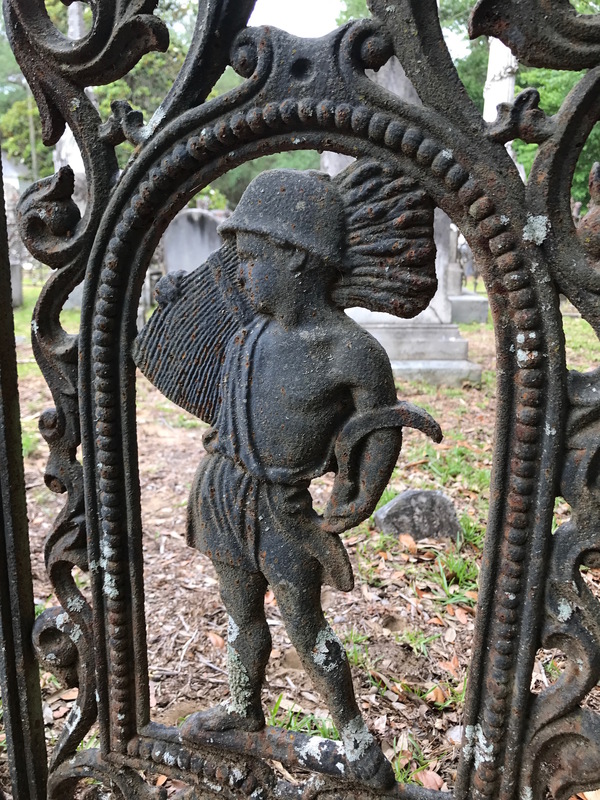 Instead, the Mikells picked out a gate that featured what appears to be two field workers with a Medieval-type feel to them. The top of the gate features oak leaves in the scroll work. The name “J. Jenkins Mikell” is also on the gate. I think this is an error on Wood’s behalf because there is nobody buried in the cemetery by that name. There is, however, an I. Jenkins Mikell buried at PCE (the “I” standing for Isaac). 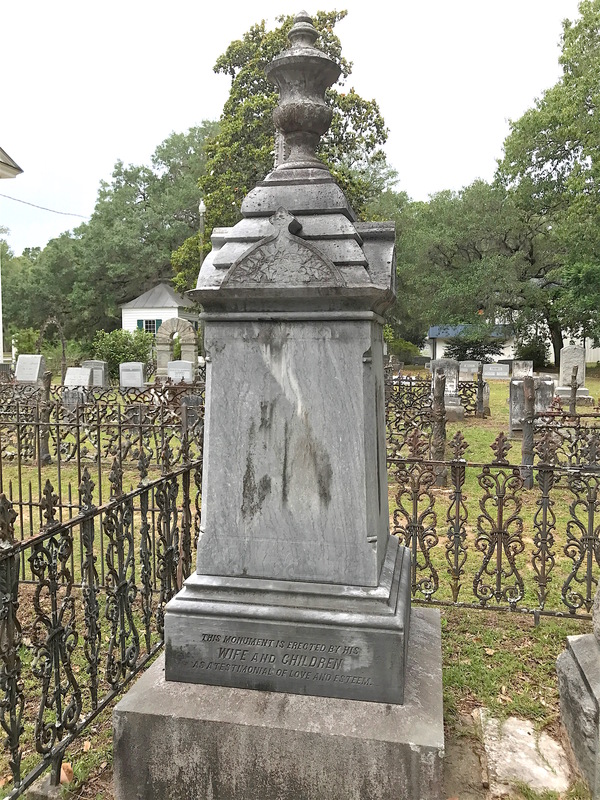 Interestingly, Isaac’s third wife Aramintha’s monument states she is the wife of J. Jenkins Mikell so it looks like this was not the first time there was an error with Isaac’s name. This gate’s figures are No. 108 in the 1848 Wood catalog. I could not find the figures in the 1867 catalog that I had access to, but Dr. Howell sent me what she had from the 1848 catalog. You can see that the Mikells chose the two center motifs for the fence. This is what they look like up close. And here’s the other one. Both are very agrarian in nature, which supports how the Mikells, Seabrooks and Edings made their fortunes by growing cotton on their plantations. I did a little research and learned that much like Julia Legare’s father, William Seabrook, Isaac Mikell (1808-1881) was a prosperous plantation owner. 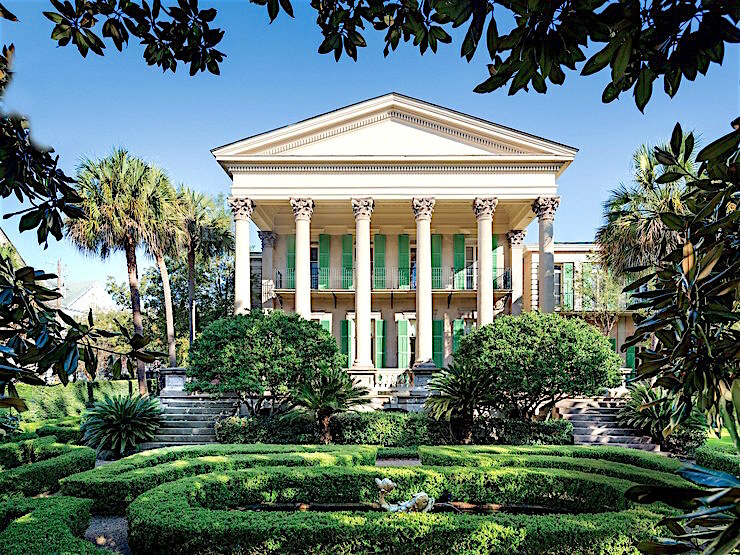 But what he’s probably best known for is the amazing home he built for his third wife Mary Martha Pope Mikell between 1853 to 1854 in Charleston. The Greek Revival residence was designed in the style of grand Italian villa and is still standing today. In 2008, the house sold for $4.8 million to Manhattan socialite Patricia Altschul. Apparently, the house is often featured on the Bravo television reality show, Southern Charm. I knew when I visited the PCE graveyard that I was in a special place like no other. But I had little idea that the same company that had made some of its cast iron fencing had also created the tomb of an American president. 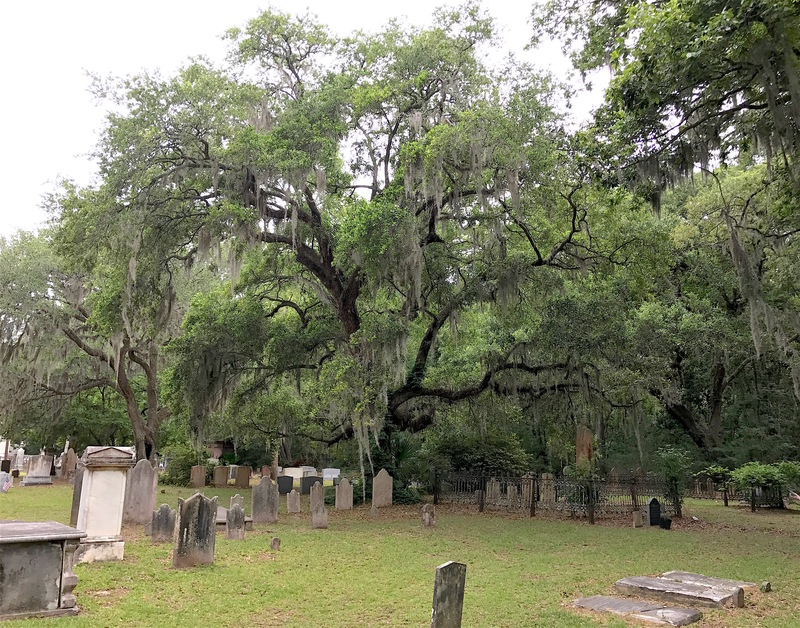 I am very grateful to Dr. Howell for contacting me so I could learn a bit more about Robert Wood and his company’s place in cemetery history. There are too many stories from the PCE graveyard to end just yet. Stay tuned for more.